The crown of thorns is a low growing, heavily branched, woody shrub, with oval shaped leaves and dense purplish-brown stems covered by many sharp, spiny thorns. Although the crown of thorns flowers throughout the year, flowering is particularly profuse during the winter months, with clusters of between two and eight flowers produced at the tips of green stems. Brightly coloured bracts (modified leaves) resemble petals and give the crown of thorns its colourful appeal, while the true flowers of the plant are small and unobtrusive. The crown of thorns is a low growing, heavily branched, woody shrub, with oval shaped leaves and dense purplish-brown stems covered by many sharp, spiny thorns. Although the crown of thorns flowers throughout the year, flowering is particularly profuse during the winter months, with clusters of between two and eight flowers produced at the tips of green stems. 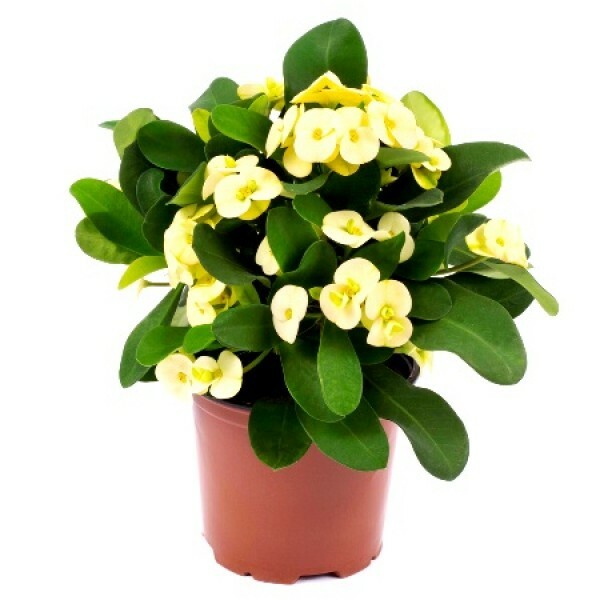 Brightly coloured bracts (modified leaves) resemble petals and give the crown of thorns its colourful appeal, while the true flowers of the plant are small and unobtrusive. Most crown of thorns varieties have stunning red bracts, although pink, yellow or whitish varieties are also known. Plants nature is outdoor & love full sun.